Wexford skipper Mattie Forde scored a stunning two goals and ten points as his side overhauled Offaly 2-14 to 0-15 in the Wexford Park sunshine, to book a Bank of Ireland SFC third round qualifier meeting with Derry. Forde netted the goals in either half - his first, a punched effort on 31 minutes putting Pat Roe's side into the lead for the first time. And despite Offaly throwing the kitchen sink at the home side, they failed to relinquish their advantage, maintaining their county's championship interest in both codes. The Wexford hurlers paraded the Bob O'Keeffe trophy in front of their home support, but Roe's charges needed little inspiration. Forde, who had already hit 4-05 past Galway in a league meeting last March, and hit five decisive points in another success over Meath, was again their driving force. Corner forward James Coughlan did help the Faithfuls into a 0-06 to 0-02 early lead though with five points by the 21st minute. James Grennan right-footed over for 0-03 to 0-02 on ten minutes, and three points in as many minutes from Coughlan (0-02) and Mark Daly stretched that lead to four. Indeed Daly's point came directly from a Coughlan goal chance, and had his effort not been saved in the thirteenth minute, it might have been an entirely different game. 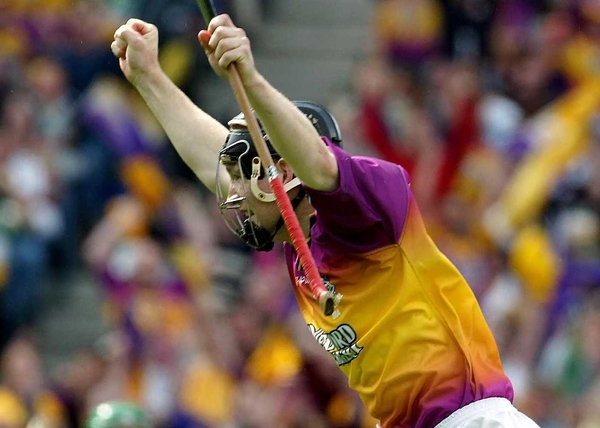 Forde had been Wexford's only scorer by this stage and he continued that trend with four more in the space of nine minutes leading up to his first goal. The Coughlans, Neville and James made it an 0-08 to 0-06 game before a raking high ball saw Offaly goalkeeper Padraig Kelly beaten as Forde leapt highest to fist Wexford in front. Midfielder Willie Carley, half forward Redmond Barry, with the outside of his right boot, and the lively Jason Lawlor pointed in the closing minutes as Wexford ended the half a goal in front - 1-09 to 0-09. Fifty seconds after the restart corner forward David Fogarty sent over an inspirational score, but it was quickly followed by four consecutive Offaly points, with two from Coughlan, another from Pascal Kelleghan and a 53rd minute leveller from corner back Shane Sullivan. A Forde free just a minute later restored the lead, another from play soon buffered it and his second goal on 56 minutes, a neat slot to an open net after Kelly had paused for what looked like a square ball, was the clincher at 2-12 to 0-13. 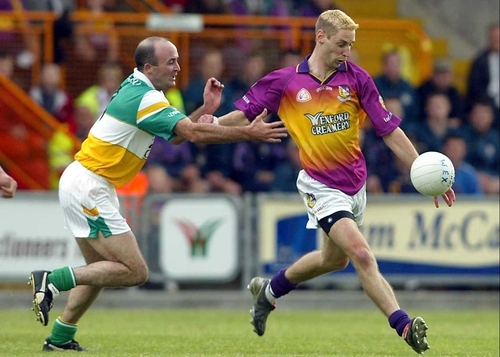 Substitute Colm Quinn kept Gerry Fahy's men interested with two late points, but Forde matched those with two more as Wexford chalked up their third championship success of 2004. Offaly's fate was completed with the sending off of centre half forward Pascal Kelleghan in injury time, for a second yellow card challenge on Wexford full back Colm Morris.